Heads down and grazing - and plenty of grass! Just what every shepherd likes to see 39 days before lambing! Based on simple math and observation, our ewes will start lambing roughly 39 days from today. I say roughly because the gestation period for sheep varies from 145 days to 155 days - that's where the math applies! We turned the rams in with the ewes on September 29, so the earliest the ewes could lamb (according to my calculations) is February 22. My observations today tend to support this prediction - the ewes look pregnant! We vaccinate the ewes four to six weeks before they lamb, which allows them to transfer some of the immunity they gain from the vaccine to their lambs. We also trim their feet - generally the wet winter weather makes their feet soft and easy to trim. And it's our last chance to assess their general health and condition before they start to lamb. As you might imagine, with the tremendous fall grass growth we had, the ewes look great! Now we enter the calm before the storm (more or less). With the ewes in the last trimester of their pregnancies, their forage consumption has increased. In essence, we've increased our stocking rate by 60 percent without adding any additional sheep. 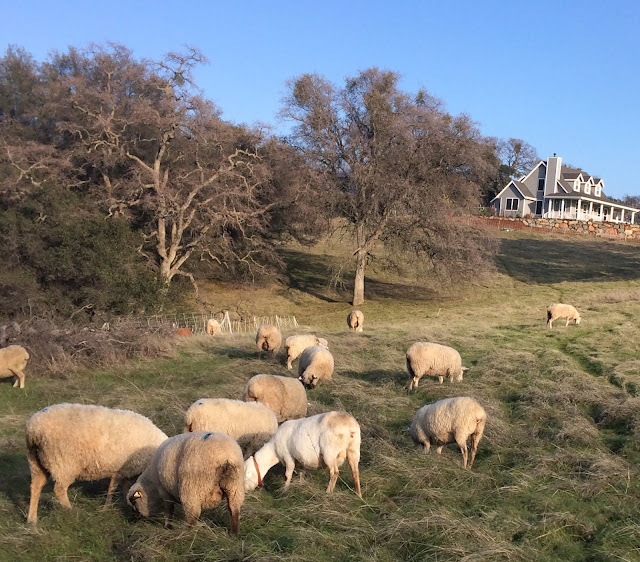 In other words, the ewes are consuming 60 percent more grass because they're eating for 2 (or 3 - or 4)! 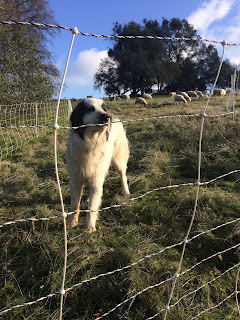 Our work in the next 39 days will consist of moving the ewes a bit more frequently than we have been - the same size pasture will last them fewer days than it did in December. Despite these more frequent moves, however, this is a pretty easy time (compared to the intensity of lambing). We're cruising until lambing begins in 5-1/2 weeks. Cruising doesn't mean we've shut of our brains, however. We're constantly thinking about where the ewes are now relative to where we need them to be at lambing. At this stage (without lambs at their sides), we can graze the ewes on open pastures even during stormy weather. Since we pasture lamb (without barns or other man-made shelter) we try to save pastures with tree cover for lambing. This means we're giving a great deal of thought to our paddock moves during the next 39 days. All farming and ranching operations are marked by milestones - planting and harvesting; breeding and lambing. Between these major events, there are minor milestones - and today we passed one of them. Vaccinations mark our last preparations for lambing - preparations that started when we selected replacement ewes 18 months ago. These preparations continued as we determined which of the older ewes should be sold last summer when we weaned our lambs. They continued in August when we mouthed and bagged the ewes (checked their teeth and udders). They continued as we fed canola meal to the ewes to get them ready to breed - and when we turned the rams in with the ewes. Now, we've done everything we can do to ensure a healthy and plentiful lamb crop in 2017.